These breakfast muffins are great for those first, busy back-to-school mornings when you’re trying to get back into the swing of packing lunches and getting everyone off to school on time. 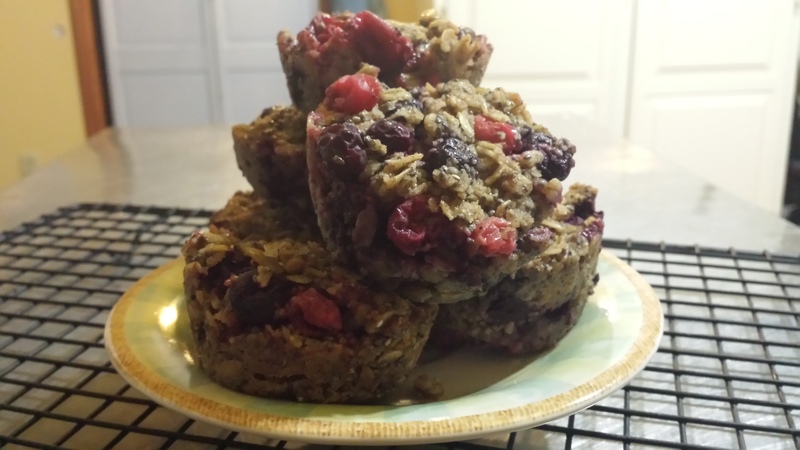 Make the muffins the day before and you have a healthy, gluten-free ready-to-go breakfast. Preheat oven to 350F and grease a muffin tray with butter or coconut oil. In a medium size bowl, mix the chia and sunflower seeds, cinnamon, nutmeg, ginger powder, rolled oats and almond flour. In a separate bowl mix all other wet ingredients: coconut oil, vanilla extract, maple syrup, eggs, cranberries and blueberries. Next pour the wet ingredients into the bowl with the dry ingredients and stir with a large spoon until uniform. Evenly divide the muffin batter into the muffin tray cups. Using a soup spoon, press down on the batter so that it is flat and packed tight; this will help the mixture ‘stick’ together. Place in oven for approximately 20-25 minutes. Remove from oven and allow muffins 15 minutes to cool before eating.